A timeless addition to all rooms in your home for that essentail extra storage. 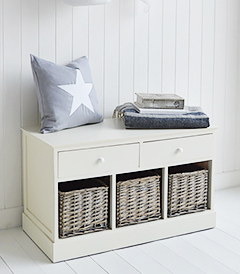 We have designed a range of basket storage furniture in white and natural to suit all styles of homes and interiors. From coastal to country, scandi to french, traditional to contemporary we have furniture with baskets for your home. Our large range of sizes will ensure that you find furniture that fits the space you need filled. As well as giving you the extra storage you need to keep your home clutter free, you will also love they way our furniture looks. Add your favourite home decor to display, or use as a lamp table to brighten up a dark corner. We know that space in your home is so important, so we have designed several narrow storage furniture ranges such as our Bar Harbor, White Sweetheart and Natural Heart.